In effect, Japan has pursued a vast monetization campaign for 26 years. The Bank of Japan creates money out of thin air and uses the free money to buy government bonds, funding the state's enormous fiscal deficits (also known as monetizing government debt). The BoJ has extended this monetization to corporate bonds and the stock market— propping up government debt, corporate debt and the stock market with newly created money. That these were once private-sector markets have been set aside, as the only thing that matters now is keeping them propped up, regardless of the cost. As I note in my new book Why Our Status Quo Failed and Is Beyond Reform, when emergency measures become permanent policies, you know the status quo is on life support. Longtime readers know I have a long history of studying Japan, starting with language and cultural studies in university (the mid-1970s) and continuing into the 2000s with economic, financial and social analyses. We have many friends in Japan (representing all age groups) and maintain an on-the-ground situational awareness of cultural/social trends. The key takeaway here is that decay can last for decades, enabling the status quo of the state and media to maintain the illusion that superficially all is well. As visitors and paid pundits never tire of exclaiming, Japan remains a wealthy nation where everything works wonderfully well—public transport, etc.—and the average lifestyle is enviable: long lives, good health, an abundance of consumer goodies, etc. But this well-being has been maintained at a high cost. Social cohesion is fraying (beneath the surface, of course), birthrates continue to decline (and what does that say about culture, that young women no longer want children? ), and the signs of economic stagnation are visible to anyone who peeks beneath the hood. Not only are some problems immune to printing/borrowing more money, the reliance on printing/borrowing vast sums of money year after year creates a new set of intractable problems. Just to give one example of many: over 80% of Japan's farmers are over 60 years of age and are poised to retire in the next decade. Printing money hasn't printed new young, eager farmers, nor has it changed the perverse incentives and political imbalances that are exacerbating the problem. Decades of borrowing money in a futile attempt to avoid structural reforms have crippled Japan's fiscal future. 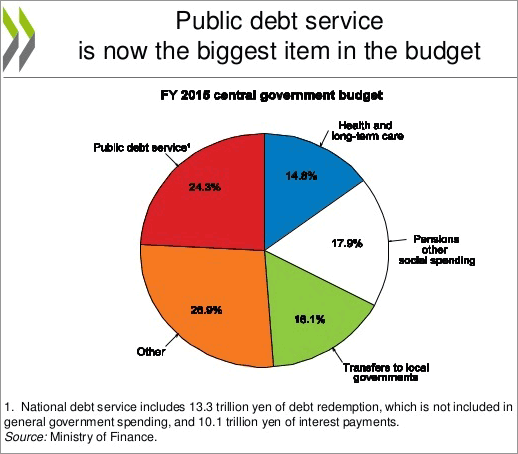 Even at effectively zero rates of bond yields, Japan now spends roughly a quarter of its government budget on debt service—and servicing of existing debt now consumes 41% of all tax revenues. While tax revenues rose a modest 15% in 26 years, total government spending soared from 60 TY to 96.7 TY—an enormous 60% gain. Cutting income taxes—another Keynesian staple—failed to accomplish anything but further weaken the fiscal outlook. The percentage of personal income taxes as a share of all tax revenue has plummeted, to no avail: all the conventional measures of economic vitality have continued their downward trend. Every status quo and every nation have pursued the same fantasy: that playing monetary games such as quantitative easing and buying stocks and bonds to prop up overvalued markets can be substituted for painful structural reforms in the core fiscal, social and financial sectors.